Reetsyburger's Refuge: Our Home has a Medallion! Our Home has a Medallion! On a random Friday afternoon, one of our new neighbors rang our doorbell to invite us over for some steaks. I explained that gerg was still at work, so I grabbed a pencil and paper to get the neighbor's phone number so I could call him once gerg got home. While I was rummaging through the drawer grabbing a pencil, I hear him say something. Steak neighbor: "Oh! I see you live in a Medallion Home." The steak neighbor pointed to the tarnished medallion on the front of our house under the house number, explaining: "A Medallion Home. 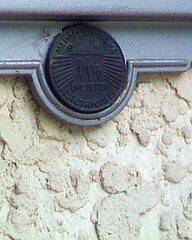 These medallions were awarded to certain houses for how they were wired back in the 50s and 60s." Me: "Really? I had no idea." Steak neighbor: "Yep. Anyway, let us know if you want steaks." Me: "Can do, and thanks!" Our house was retro-fitted with gas at some point, and we hope to alter it even further with off-the-grid power, but it's neat to learn wacky stuff about our house from neighbors who stop by to offer steak.